Amidst thunder and lightning, three witches meet to plan their encounter with Macbeth, a Scottish general and the Thane of Glamis. They agree to gather again at twilight upon a heath that Macbeth will cross on his way home from battle. King Duncan is delighted at his captains' bravery, and, when Angus and Ross arrive to tell him that the Thane of Cawdor has surrendered, Duncan gladly hands over the Thane's title and all his land to Macbeth. The Witches meet on the dark and lonely heath to await Macbeth. To pass the time they exchange boasts about their evil deeds. Macbeth and Banquo come across the Weird Sisters and we see immediately that Macbeth has a strange connection to the Witches, mimicking their famous words spoken earlier in the drama: "So foul and fair a day I have not seen"(1.3.38) . The Witches address Macbeth as Glamis, Cawdor, and King of the Scots. Macbeth is startled by what he sees clearly as a prophecy that he will be Scotland's next ruler. He is too stunned to speak and thus Banquo asks the Witches if there is any more to their premonition. They do have something to add, not about Macbeth, but about Banquo. They talk in riddles, telling him he will be "Lesser than Macbeth, and greater" and "Not so happy, yet much happier" (1.3.65-6). They also tell Banquo that even though he will never himself be king, he will beget future kings of Scotland. Then the Witches disappear into the darkness, despite the pleadings of Macbeth, whose shock has turned to the lust for more information. Once alone, Macbeth and Banquo pretend not to believe anything the Weird Sisters have said, but in secret they cannot help thinking that there is a little truth to the Hags' words. Ross and Angus arrive and inform Macbeth that Duncan has appointed him Thane of Cawdor. Macbeth and Banquo are stunned by the turn of events, realizing that the Witches are right about one facet of the prophecy, and Macbeth cannot help but focus on their other, greater prediction that he will be king. Macbeth and Banquo reach King Duncan's castle and Duncan praises Macbeth for his loyalty and valor. He also embraces Banquo and thanks him for his courage during the rebellion. He announces that he has decided to visit Macbeth's castle at Iverness, and that he has chosen his son, Malcolm, to be the Prince of Cumberland and, therefore, the next king of Scotland. Macbeth proposes that he leave early for his castle to make sure everything is perfect for the King's arrival, and Duncan happily approves. But Macbeth is really only concerned with the King's choice of successor. With ambitious thoughts racing through his mind, Macbeth again finds himself lusting after the crown: "Stars, hide your fires/Let not light see my black and deep desires" (1.4.50-1). Macbeth arrives at the castle and Lady Macbeth is ready to tempt him to join her in murder. She subtly hints at her intentions: "Your hand, your tongue: look like the innocent flower/But be the serpent under it. He that's coming/Must be provided for..." (1.5.65-7). Macbeth dodges the matter at hand and sheepishly tells her that they will speak further on the subject. Lady Macbeth confidently assures him, "Leave all the rest to me" (1.5.74). Duncan arrives at the castle with his sons, and Banquo, Lennox, Macduff, and others in his party. Ironically, Duncan and Banquo discuss the beauty of the castle while inside it reeks of moral decay. Banquo goes so far as to say that the "temple-haunting martlet" does approve of the castle and its sweet smelling fresh air. Unbeknownst to Banquo, this is a particularly inappropriate reference to the martlet, a bird known for building its nest near holy places. Lady Macbeth is the first to greet Duncan and his court. She welcomes them gracefully to her humble abode. As is the custom of the land, she tells the King that she has prepared an account of all that she owns so that Duncan may perform an inventory of his subjects' belongings. But Duncan does not want to discuss such matters. He again expresses his love for Macbeth and they all move behind the castle walls. 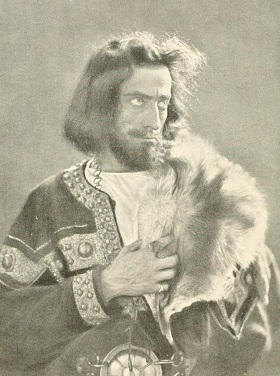 Macbeth is alone in a dining room in the castle. His conscience is acting up, and he is particularly worried about the punishment he will receive in the afterlife. "If it were done, when 'tis done, then twere well/It were done quickly." If there were no consequences to be suffered for killing Duncan, then Macbeth would not be so reluctant. But he concludes that even if heaven were not going to judge him, he cannot bring himself to kill Duncan, whom he believes is a good man and an excellent monarch. Lady Macbeth walks in on her husband and sees the indecision on his face. Macbeth tells her that he has changed his mind: "We will proceed no further in this business" (1.7.31). Lady Macbeth, who is ruthless beyond comprehension, refuses to accept Macbeth's decision. Instead, Lady Macbeth plays upon his emotions, calling him a coward and accusing him of not loving her. Her cunning words work well on Macbeth, and she turns his mind back to thoughts of murder. However, he is still afraid and he asks her "If we should fail?" (I.vii.53). With conviction and confidence enough for both of them, Lady Macbeth responds to her husband's doubts: "We fail! But screw your courage to the sticking place/And we'll not fail" (1.7.54-56). Macbeth is once and for all convinced -- they will proceed with the murder of the King. What hands are here? Ha! they pluck out mine eyes! Lady Macbeth comes back, now with hands equally bloody. They hear a knock at the castle doors and Lady Macbeth again demands that Macbeth wash up and go to bed, for they must pretend that they have been sound asleep the entire night. Macbeth's words of regret bring the scene to a close: "To know my deed, 'twere best not know myself/Wake Duncan with thy knocking! I would thou couldst!" (II.ii.73-6). The knocking at the south entrance grows louder and more frequent. A porter walks slowly to open the doors, pondering what it would be like to be the door-keeper of hell. Macduff and Lennox are at the doors, arriving to visit King Duncan. Macbeth comes down to greet the two noblemen. Overnight he has fully regained his composure and pretends that their early morning knocking has awakened him. Macduff proceeds to the King's chambers while Lennox tells Macbeth about the fierce storm they encountered on their journey to Inverness. In the howling wind they heard 'strange screams of death' (2.3.46), and there were reports of the earth shaking. Macbeth's response is ironic and cruelly comical: "Twas a rough night" (2.3.47). Macduff re-enters, screaming that the King has been slain. He tells Lennox that it is a horrible and bloody sight, comparing it to Medusa herself. He rings the alarum bell while Macbeth runs to King Duncan's quarters. Macbeth reaches the guards who have been awakened by the bell. Before they can proclaim their innocence, Macbeth kills them and reports to Macduff that he has murdered Duncan's assassins in a fit of fury. Lady Macbeth pretends to collapse in a shock and, while the rest of the men tend to her, Malcolm whispers to his brother, Donalbain. The brothers are not as easily deceived as the others and they know their lives are in grave danger: "There's daggers in men's eyes" Donalbain adds, and they agree to flee Scotland. Malcolm will go to England and, to be extra cautious, Donalbain will go to Ireland. In this brief transition scene, an old man reports to Ross the strange omens that have coincided with Duncan's murder. Macduff enters and tells Ross that, since the King's two sons have fled Scotland, they are presumed to be the masterminds behind their father's murder. As a result of their treachery, their claim to the throne is forfeit, and Macbeth will be named the new King of the Scots. Mabillard, Amanda. Macbeth: Plot Summary. Shakespeare Online. 20 Aug. 2000. < http://www.shakespeare-online.com/plays/macbeth/macbethps.html >. The action of the play takes place over nine days. The historical events chronicled in the play actually took place over the period of about eighteen years.